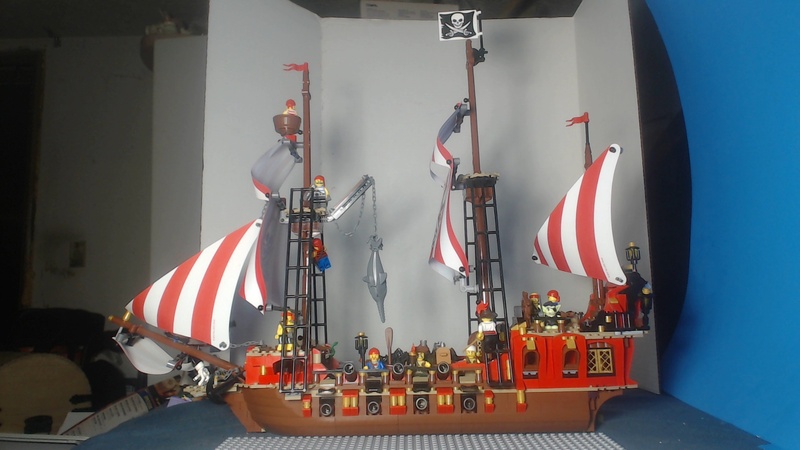 EDIT: Apologies to Captain Braunsfeld, After doing a search on "Brick Bounty" for more ideas and insight after posting this thread, I had found he had done something similar with his MoC Brick Bounty. 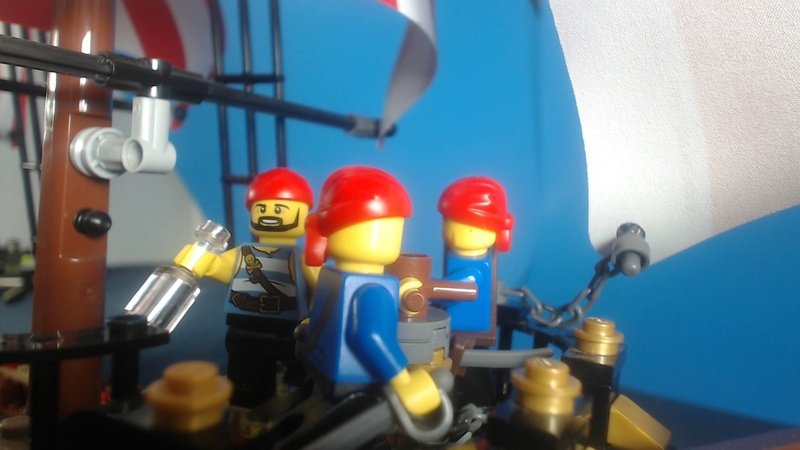 Another three mast configuration, and the THIRD appearance of Billy the Pirate. 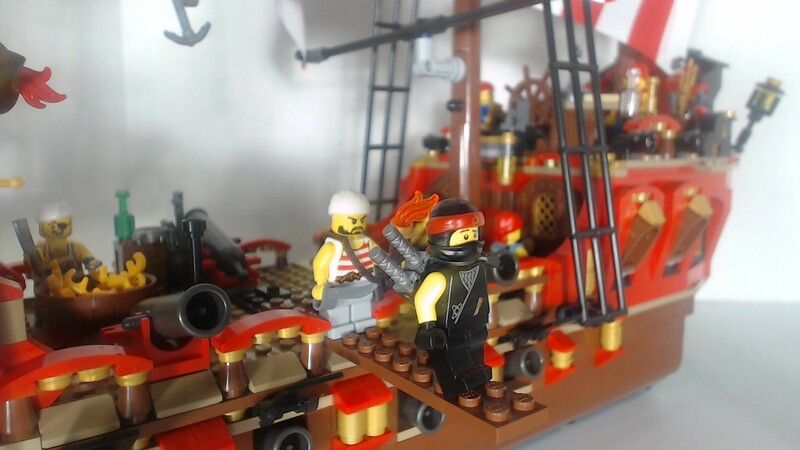 Also, I love the extra details BrickOn put into his Bigger Bounty as well, including a bed for the Captain, and Bunks below decks for his crewmen, and a vastly superior Galley build. 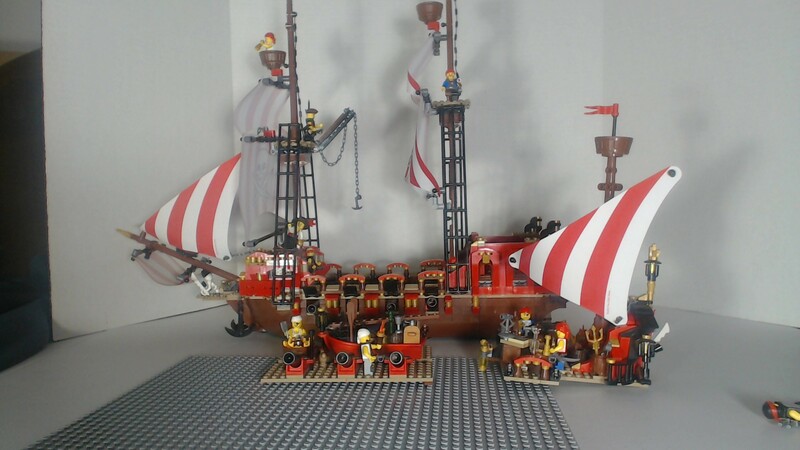 I myself had dabbled with two copies of the Brick Bounty myself, after seeing a thread where some builders said that they had difficulty putting a whole ship together with two sets, because of it's piece count. 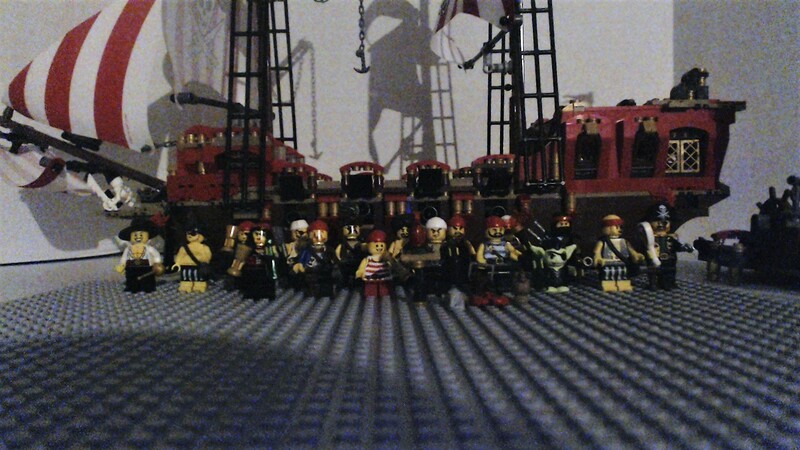 I have procured a third copy of the set, and conspire to merge it into my own MOC. This thread is mostly for the sake of posterity before I tear it down and build it up again, but more than anything, I want to share what changes I have made to my Bigger, Brickier Bounty. The first thing I want to point out is that I extended the hull by one extra segment, and I gave it a third mast. While it does look impressive, ultimately it's difficult to maneuver the figures during play. 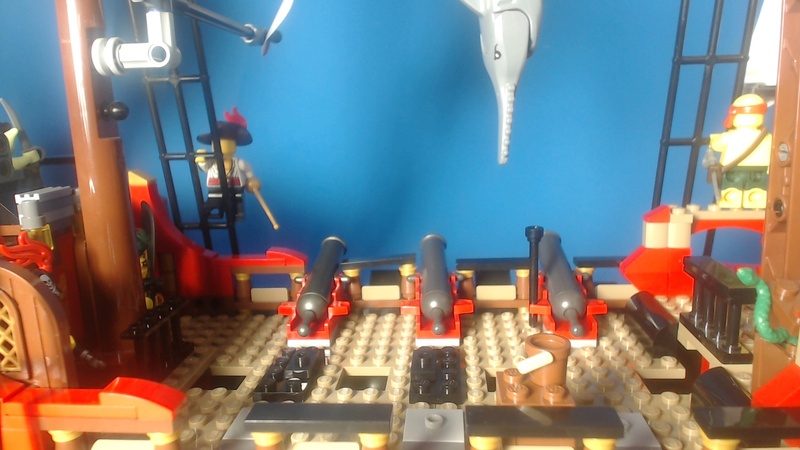 Also, the plates on the port and starboard sides flanking the bow was a bit of "Cheating" on my part, those red angle plates serve to conceal the awkward connection between the two bow segments. I made it work, but ideally, I'd have used brown plates instead of the dark tan ones. I would have loved if you could stack multiple bow extenders on top of each other flawlessly, but I was able to use plates and studs to make a sturdy, legal assembly. Also note the added sail at the bow of the ship as well. And the working compass inside the Nest in the bow! 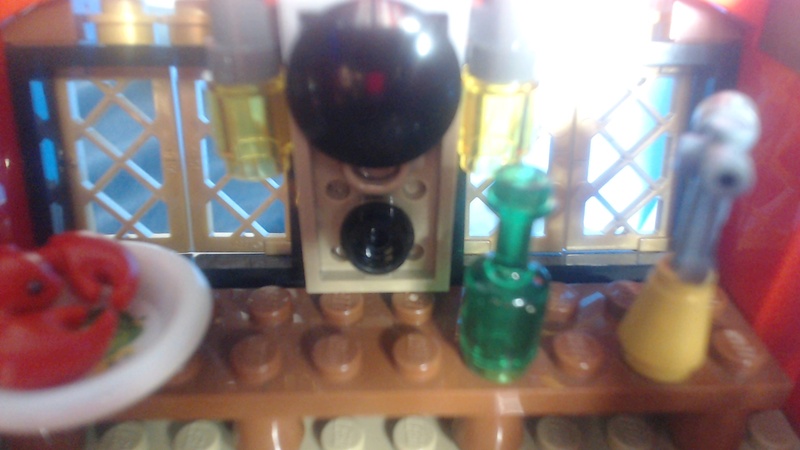 I've also modified the Anchor mechanism so that Minifigures can manually raise and lower the anchor as well. "Blast it Billy, quit hitting that bottle and give us a hand!" 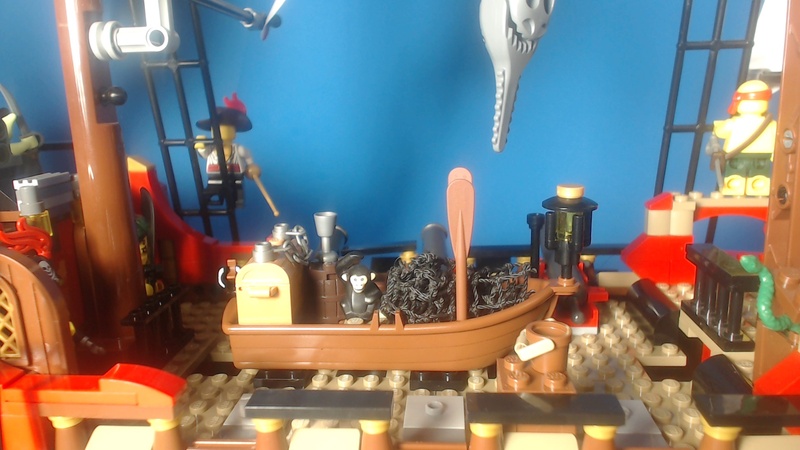 And the exclusive Minifigure from the 2015 exclusive "Pirate Adventure" set, who I have come to affectionately call "Billy" on account of him/his particular face, while common, bears a striking resemblance to a certain famous Celebrity Pitch-Man. The other pictures enclosed are just miscellaneous shots around the ship. "Oh my! But Rodrigo, you know I am betrothed to Captain Roger!" "So you are... But what the good captain does not know, will not hurt him, Chere!" Swordsman Samir, the newest addition to the crew, takes his job as the Captain's bodyguard very seriously. 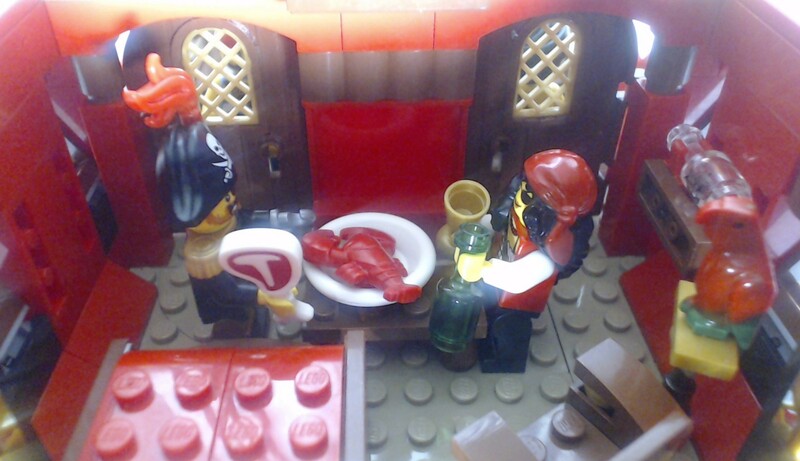 Inside the cabin, as Captain Roger II, esquire is enjoying some surf and turf, Bonnie Lass tells him of Rodrigo's treachery. "Arr, I'm not worried, Lass! Men like him be all spark, and no steel! The only reason I keep him around is for Fodder for the Imperial Guardsmen! Plus, it's funny when Samir stares him down!" 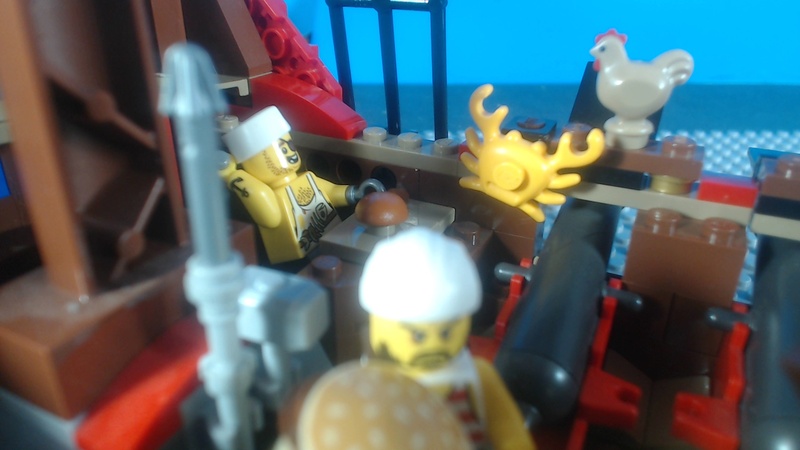 Other things of note: I've also, through official stock parts, as well as pieces from my own collection, extended the Captain's Cabin by one whole brick, making Figures with hats and embellishments (Roger II's Captain's Hat with Feather, as an example) able to stand comfortably without hitting the ceiling. I will keep you all updated as I make enhancements and improvements on the ship's design. Teardown has begun. Port and starboard sides of the ship have been obliterated, and two masts have been removed. Welp... I was going to be methodical about it, and pace myself over the span of a couple of days, take pictures, that kind of thing... but I built the whole thing in about 5 hours. I'm going to sleep, then I'm going to post pictures, with my thoughts on the build. Not bad I would say! Not bad at all! The more detailed, the better! Eagerly waiting for more of your ships! I'd have posted pictures sooner, but one of the bulbs in my studio space burned out. Not a major loss; $5 tops. Posting pictures of the completed build tonight, with a small review/critique. MOC Dissection of 74013X3, Aka "The Skull Brother"
Five hours of tearing down and building up, and I reproduced "The Skull Brother" From the Youtube Video I previously linked! One of the things I absolutely LOVE about this model is the attention to detail on the ship. A rowboat can be placed on the main deck, and removed with ease. 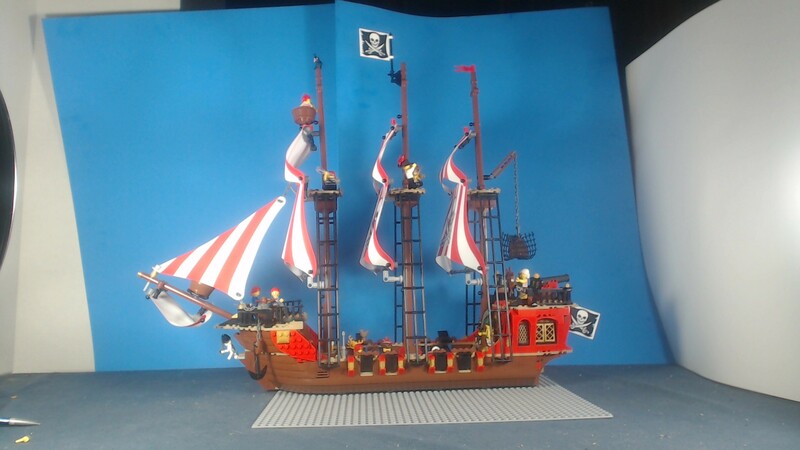 Actually, the fact that the main deck is sturdy and there is plenty of room to maneuver and manipulate figures and props is a big plus in my book. And this is another big plus and minus at the same time for me. The Main deck can be removed with ease, revealing the lower levels of the ship, complete with Cannons and provisions for the crew. 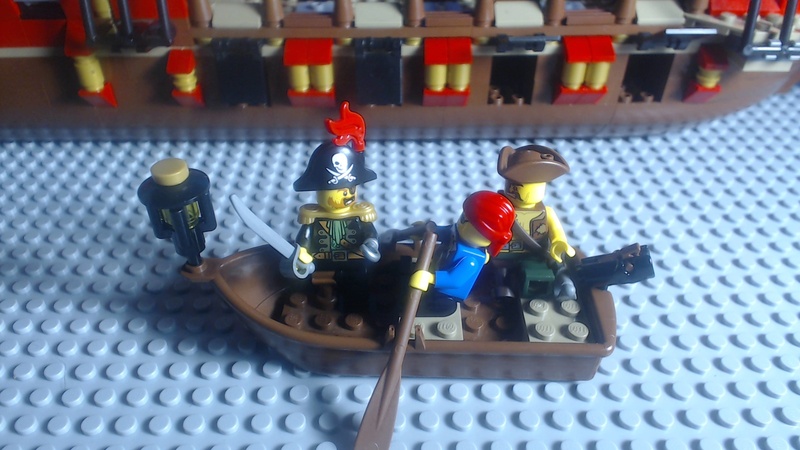 While I love this, I don't like the fact that a minifigure can't stand comfortably below deck with the main deck in place. 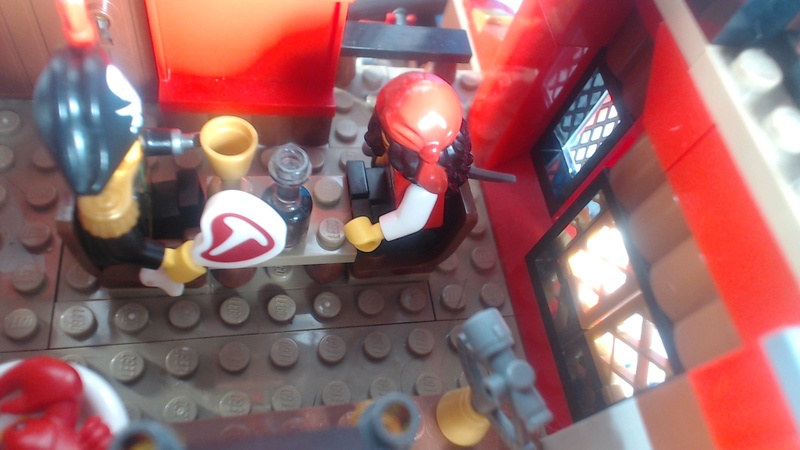 I don't even think it could accomodate a Minifigure in a hat sitting down. 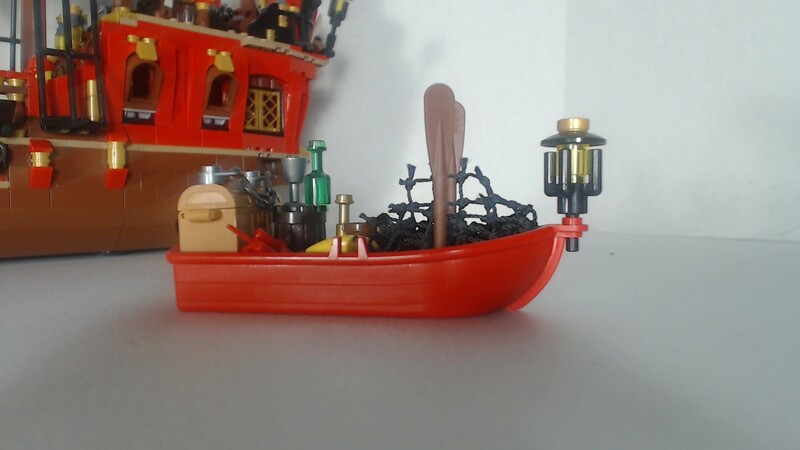 Plus, based on personal experience, I've had to remove all the guns, the rowboat, and any figures on the upper deck plate before carefully trying to set the deck plate in place. it takes two minutes or so to get it setting just right. The back of the ship (The Poop?) With imposing skeletal Ornamentation. I used a sword from the Ninjago Sky-Pirates line, as well as repositioned his left arm, and equipped it with a black chalice. 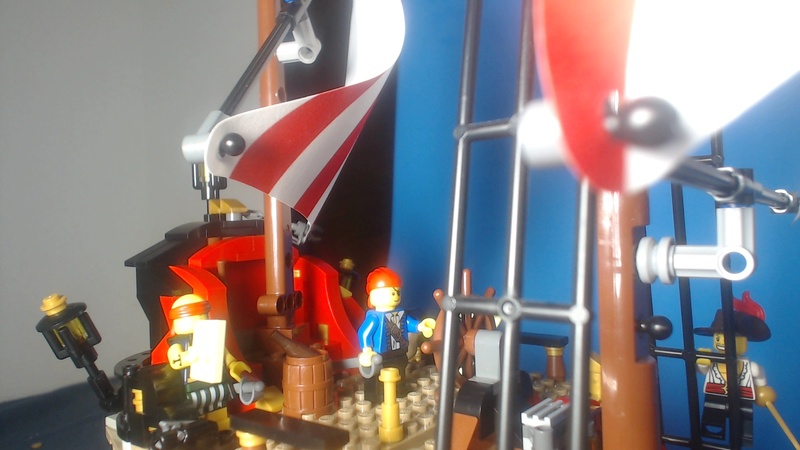 The figurehead upfront has a similar configuration, but without the sword, because I had a difficult time getting the figurehead to hold the sword, on account of it's close proximity to the mast. 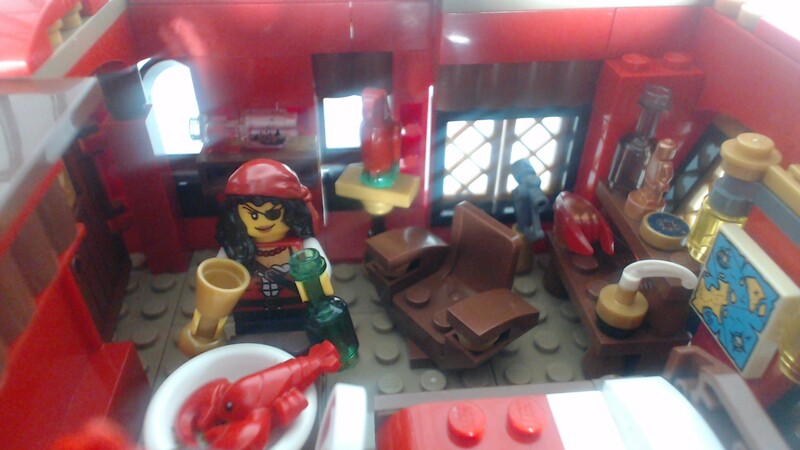 Rummy's Brother, Cookie, in the Captain's Cabin, preparing Roger II's Lobster Thermadore. Another thing I dislike about the new build is that it returns the cabin to it's standard size, making it impossible for Roger II with hat and feather to stand comfortably in the cabin with the ceiling in place. Also, the two columns, while annoying, are necessary for the stability of the navigation deck. I also replaced the plate windows with 1X2 curved frames. Next paycheck, I'll put pearl gold lattices into the frames. The interior of the Cabin, part two, with... is that supposed to be a pendulum clock? or a barometer? After the next round of modifications, I may put something else here. And the all important concealed compartment play feature! I remember something iconic about this kind of picture; Captain Roger/Redbeard, in a Rowboat, with his crewmen rowing him around... 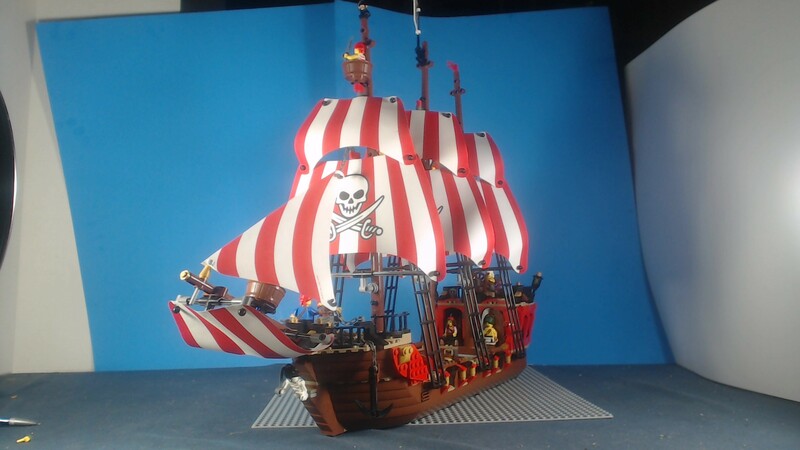 I can't remember if it's a picture from the back of a Classic-Pirates era set, or something from the old US Adverts... but something about it compelled me to take a vanity shot as well. 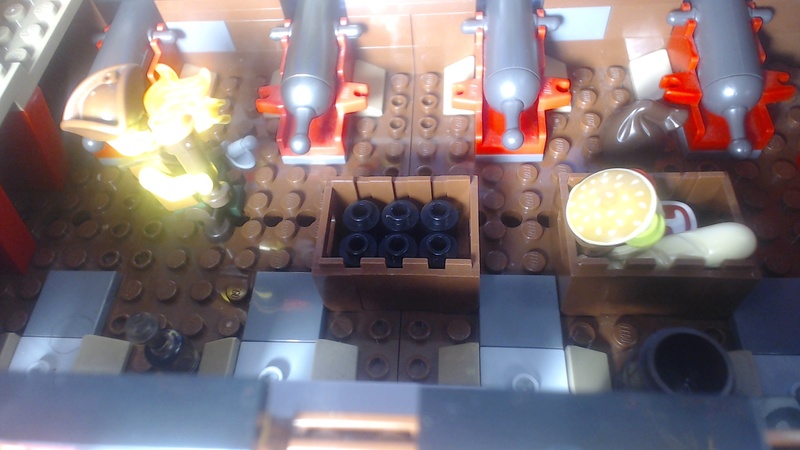 The only major downside I can see, however, is that you can't have minifigures in the bowels of the ship, unless they're laying down, or sitting with their hats in their laps, and the Captain's cabin could stand to be at least one brick taller. I'd also go through and replace many of the Grey or black slicker plates with either brown or dark brown, and the single grey slick studs with Gold ones as well. and the black rails on the ships... oh, in a perfect world, I'd replace all 8 of them with 1X4 Curved slick pieces, and add 1X1 pearl gold studs in the middle of them, to make it look like more of a unified build. 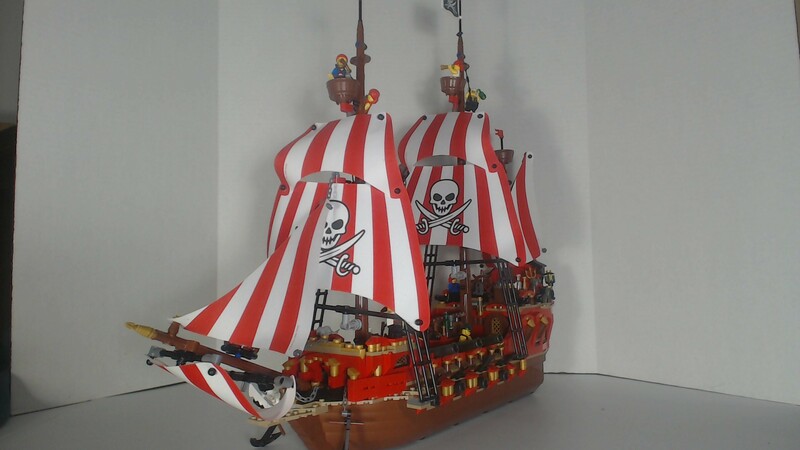 Aside from that, if you happen to have 3 Brick bounties just lying around, and bricks enough to build up the captain's cabin and the body of the ship (1 brick, 1.66 Bricks, tops) I would say definitely, go for it! 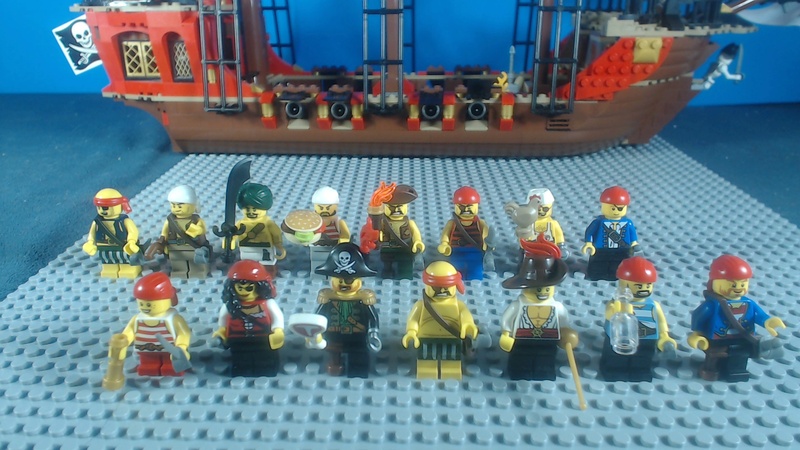 Otherwise, Sit and wait and see what Lego has to offer for us, if anything, come the 30th anniversary of Lego Pirates! 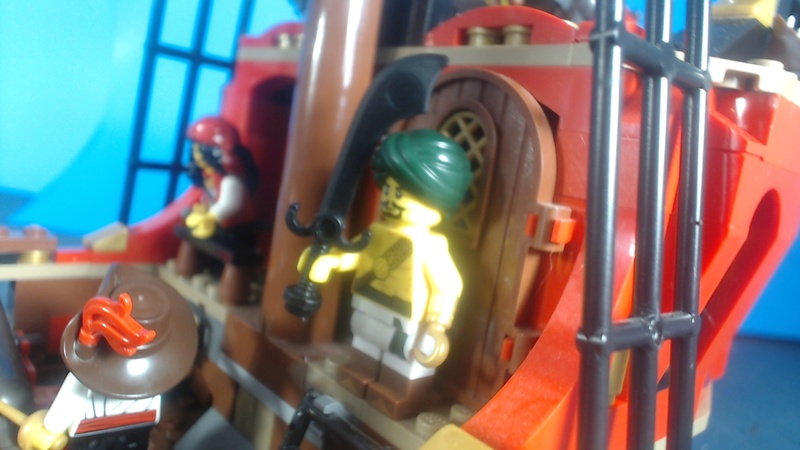 I officially rate this build, a Pirate Minifigure with a Hook Hand, because Hookhands are awesome! I saw that the crew is fed on burgers, but where is the rum to go with it? Arr, only two people know where the Rum is stashed. Well, 3 really: Rummy jr., Cookie, and Captain Redbeard II. Oho... It's almost done. Cookie has to order more rum, but it's almost done...! Apologies, I still need to get a second studio light, but I can't wait to share the latest revision of this build. Title inspired by Cards Against Humanity, I present, The Biggest, Blockiest Bounty. 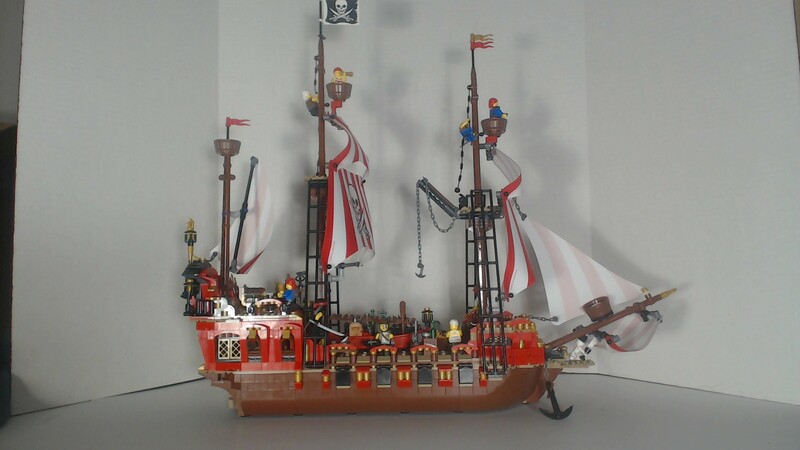 This Beastly, Brutish, Brick-Built Brig was built with Three 70413 Brick Bounties, and the Hull was further supplemented with LEGO Minecraft 21115, The First Night, and countless spare pieces from 3 or more return trips to my local dealer of Discontinued/Hard-To-Find/Exclusive LEGO Sets. A better shot of the other side. Sorry for the quality of this picture in particular; Studio lights were glaring too hard on the crew, and I had no means of softening/dispersing the studio lights, so I thought I would try to compensate by adjusting contrast and brightness. 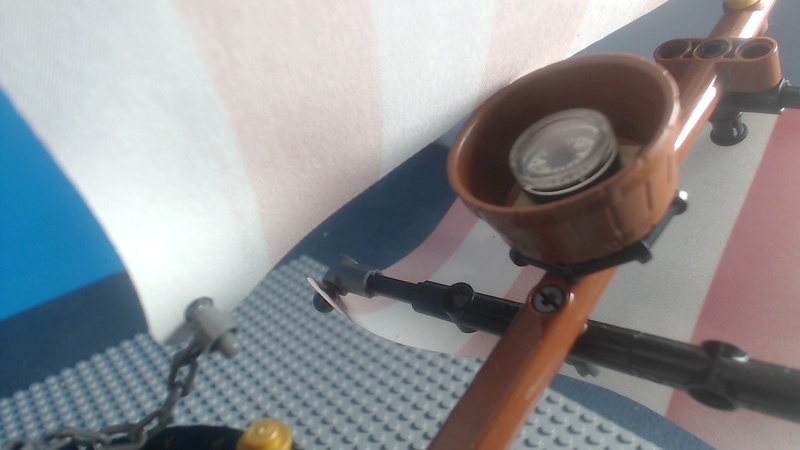 -While I do not collect LEGO Elves at all, I do like Aria's Airship, and I like Dukeblin, mostly because of the eyepatch. So, in this model, he's stowed away aboard the ship, below decks, chasing rats and mooching off the crew rations. - Along with the 4 animals on display (Parrot with stand, Rat, Lobster, and Chicken; Cookie's beloved pet.) There's also a Monkey from the Series 5 Zookeeper... or is it the Series 7 Jungle Boy? and there are CRABS. LOTS OF THEM. THE CREW SUBSISTS ON RUM AND CRAB MEAT. One of the things that bothered me about the original Skull Brother Build was that Figures could not stand comfortably below deck. After my modifications, this is no longer the case. 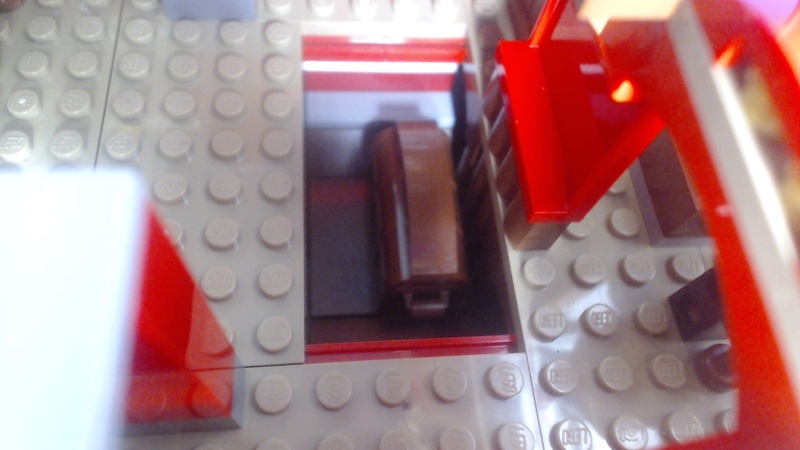 There is easily a brick or a minifigure's head's worth of room between the ceiling below decks and a standing figure. 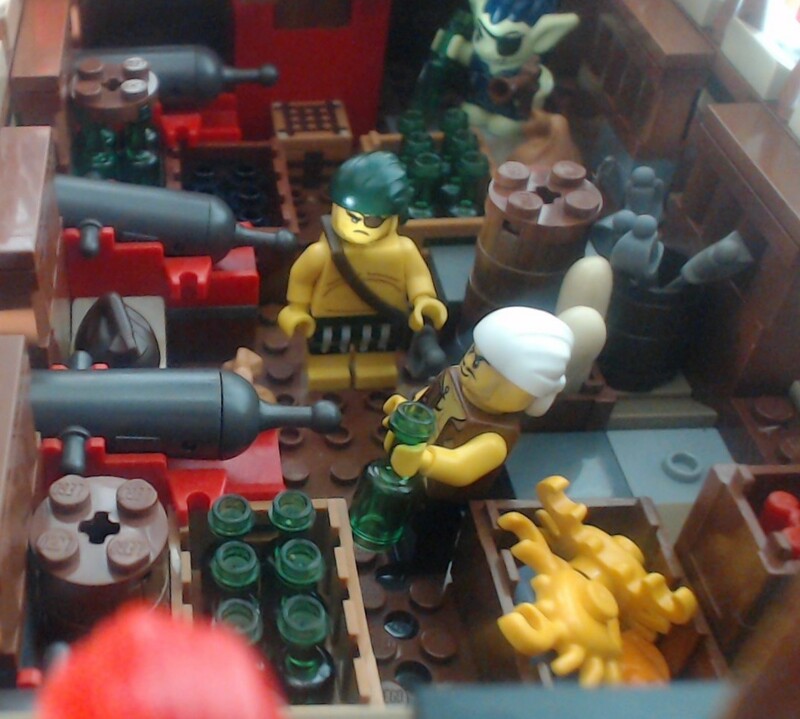 I've also gone to town adding all manner of details below decks as well, numerous crates containing food, Rum, Cannonballs, Smaller Casks and crates with Swords, Explosives, etc. The Cabin is next, and I put in such detail. Something I neglected to add was that the hidden chamber playfunction from the previous builds is still intact, and as easy as ever to get to. From this shot, you can see Captain Roger II entertaining Bonnie Lass with Surf and Turf, as Polly watches on. 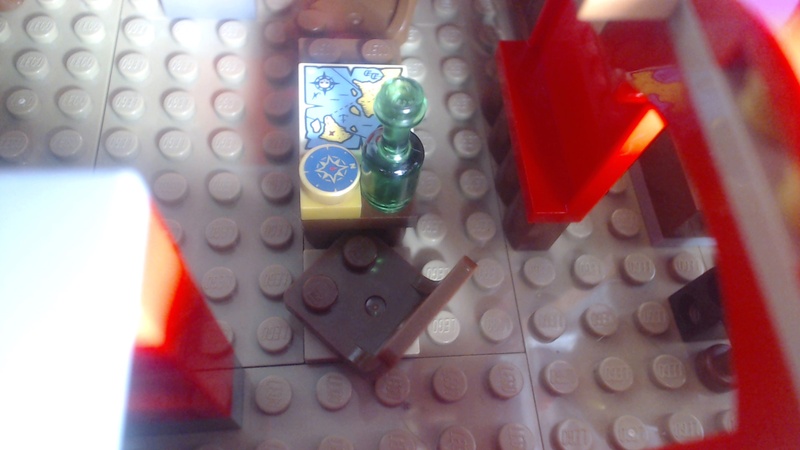 There is also a small ship in a bottle on the right wall as well. 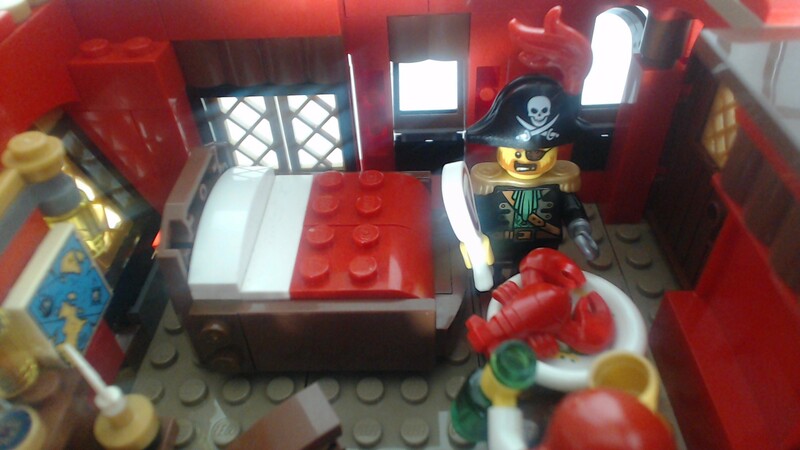 From this shot, you can see the Captain's luxurious bed (I really wanted to make a bed with a similar play function to Master Wu's Bed on the Lego Ninjago Movie's 70618 Destiny's Bounty set, but this one is fine as well; Figures can sit on it, and set things on it.) As well as a map mounted on the back wall of the Cabin. 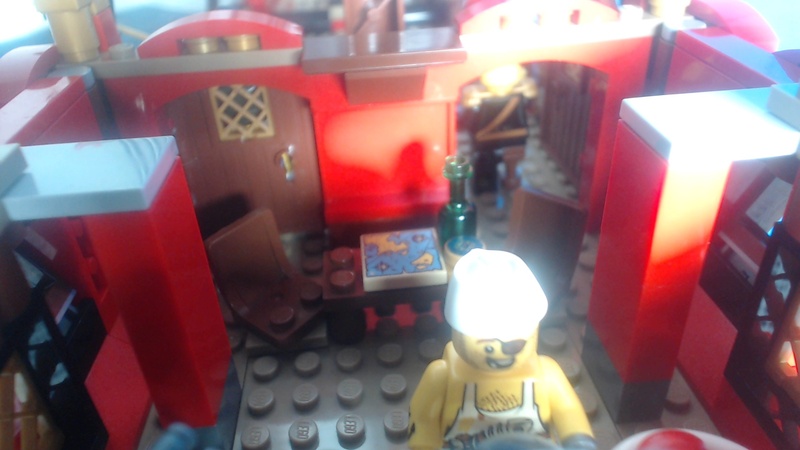 And from this side, you can see the rest of the Cabin, featuring the Captain's desk, with quill and ink bottle, Smaller trinkets and baubles from past adventures, a nice desk chair, and again, the mounted Ship in a bottle. 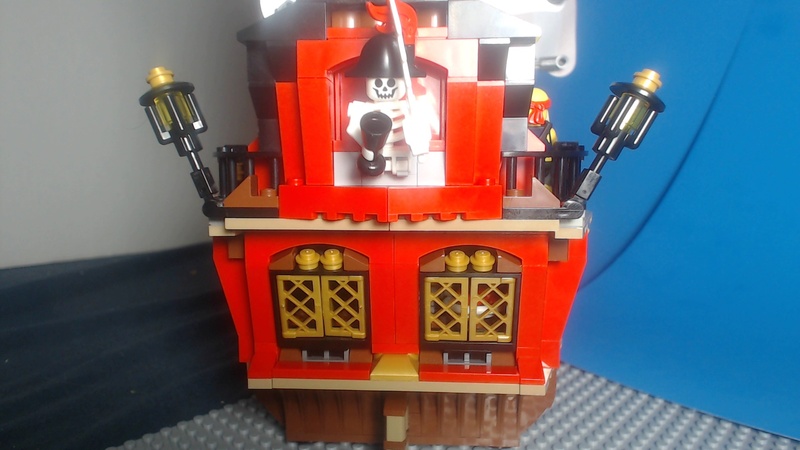 Also, The Captain, with his feather in his cap, can stand comfortably inside his cabin again, without hitting the ceiling, thanks to the Captain's Cabin being extended an extra brick higher! This is the Ship Exploded, with the Upper Deck portion and the Navigation deck removed. I really like what I did for the guard rails on either side of the ship as well. 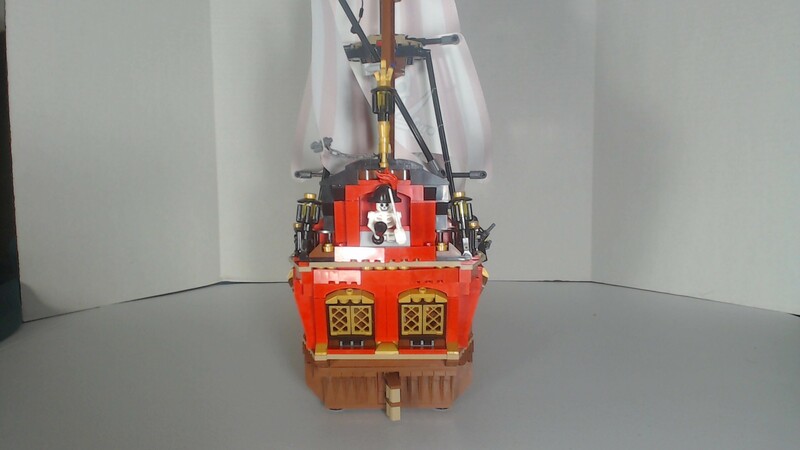 Using pieces from my collection, I was able to replace the 8 Black 1X4 Slick tiles that acted as the guard rails with 1X4 Curved Red Arches, ornamented with 1X1 Pearl Gold studs, which add to the uniformity of the color and design of the ship. 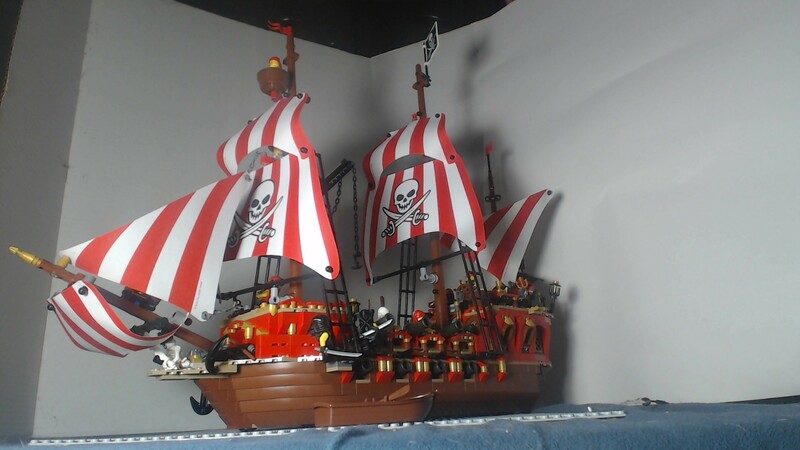 Also; I was able to fit the 1X2X4 Window pieces (the ones with the sticker lattice patterns on them) into the gaps near the bow of the ship, with the addition of a 1X2 Black slick tile, which makes for a perfect fit!, and to hold them in place, I used the 1X2 Tile Brackets with 4 studs on the side of them. A detailed shot of the Dinghy on the main deck of the ship. I swapped it out for a Red one from my collection, because Red Seems like the major color in this build. 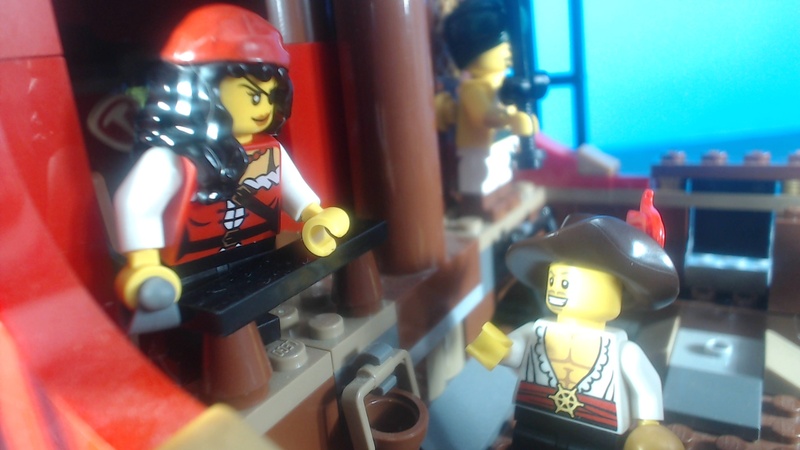 And a final detail shot, where the Pirates make use of their 2X14 Stud Plank to rid themselves of their pesky Ninja guest! Apologies for the varying quality of the pictures, but I hope you enjoyed reading about this build as I have putting it together! 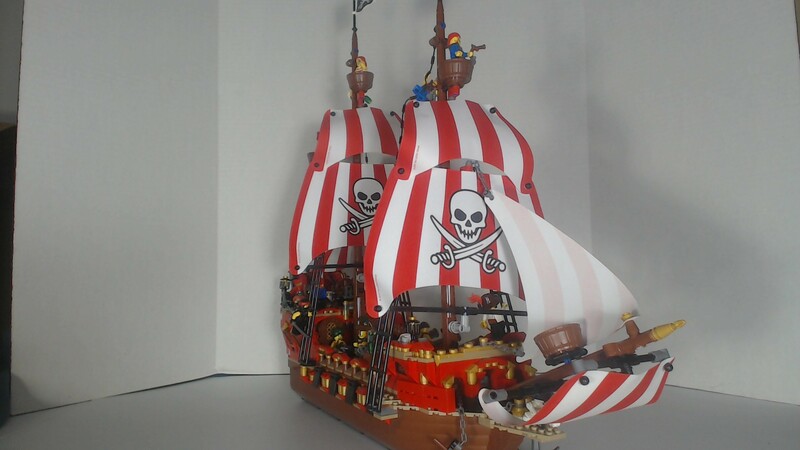 In a fight, This ship would handily sink Brickbeard's Bounty, and the Brick Bounty, no contest! However, It would face some manner of difficulty going up against the Imperial Flagship. I Posted a Video of the most recent build of the ship today, showcasing many of its features and accessories.